Activision has officially announced the zombie mode in Call of Duty: Black Ops, along with a strange teaser website. The new zombie mode coming to Call of Duty: Black Ops was officially announced by Activision and Treyarch today, accompanied by a recent major change in a teaser website that has associated it with the mode. Treyarch admittedly called zombies in Black Ops one of its "worst-kept secrets." The zombie mode will once again feature four-player co-op, just as in Call of Duty: World at War. "We've taken extra special care to retain the essential ingredients of our zombie game, and have also crafted a nice surprise for the fans," Treyarch head Mark Lamia said in a press release. With him also recently saying that Treyarch has "evolved" zombies, I think it's safe to say that the mode won't be the exact same thing we've seen before. As previously revealed, four World at War zombie maps are confirmed to be in the hardened and prestige editions of Black Ops. Further, the tomfoolery related to a mysterious viral marketing promotion back in April that led to a website called "GKNOVA6.com" was also recently revealed to be related to Black Ops' zombie mode. 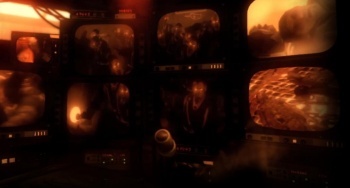 The site, tied to Black Ops in the past, now shows nine screens playing footage of zombie soldiers wandering about in various locations and causing mischief. The scene appears to take place in a facility where zombies have taken over, as a zombie wanders into the background and pounds on a glass barrier trying to get in. Now that the zombie mode is finally out of the way, Treyarch has also made it known that Black Ops's Combat Training mode will support from one to six players in co-op. Combat Training is a bit different from the zombie mode, as it's meant for players to practice their multiplayer skills and learn maps with the incorporation of AI-driven opponents. It appears to be an attempt to make multiplayer friendly to new players, but it'll probably just make 12-year-olds even more deadly. So if you like playing with friends, there'll still be plenty of opportunity to do so in Black Ops against both undead and live computer-generated opponents. It's assumed that Black Ops will still provide the ability to go up against real humans when it's released on November 9, 2010.